Submitted by Quest-News-Serv... on Tue, 06/25/2013 - 13:07. NEVER sold out to tax lien thieves. No property tax foreclosures filed by the county. According to Fiscal Office records, this trouble making property is owned by deceased Charles Wolf. And the county made a mistake by not enforcing property tax collection fairly by overlooking the Brayton Avenue property taxes for years. Submitted by Quest-News-Serv... on Fri, 06/07/2013 - 21:30. Submitted by Quest-News-Serv... on Wed, 05/02/2012 - 19:37. Submitted by Gone Fishin on Tue, 06/25/2013 - 15:54. 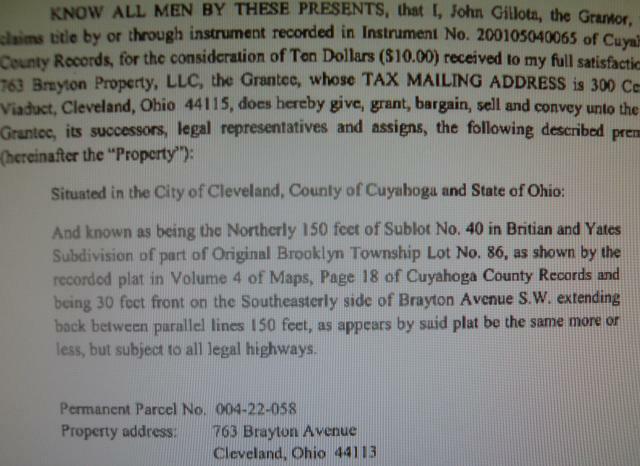 Type in the parcel # for 757 Brayton Cleveland, Ohio - PARCEL # 004-22-056 and a date. The parcel numbers are one digit off. I personally do NOT believe that John Gillota or 763 Brayton Property LLC has done anything wrong. It appears that the person entering the information made a mistake with the parcel #. Timeline of Rokakis, Cummins, Brancatelli deceit on near west side. CLEVELAND’S 26TH ANNUAL PARADE THE CIRCLE -- AN ART EXTRAVANGANZA, JUNE 13 2015, CLEVELAND, OHIO!